Cardinal George Pell is challenging his child sexual abuse conviction on three grounds, including saying that the trial had a "fundamental irregularity". The ex-Vatican treasurer abused two boys inside a Melbourne cathedral in 1996, a jury found in December. His lawyers argue that he was wrongly prevented from entering his plea before a jury, according to court documents which have been republished by Australian media. The defence team also argues that the jury's verdict was "unreasonable" because it relied too heavily on one person's testimony. A jury unanimously convicted him on one charge of sexually penetrating a child under 16, and four counts of committing an indecent act on a child under 16. 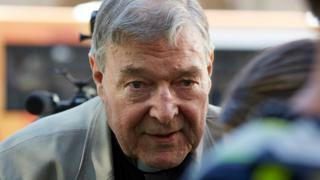 Pell was remanded in custody on Wednesday and is due to be sentenced on 13 March. 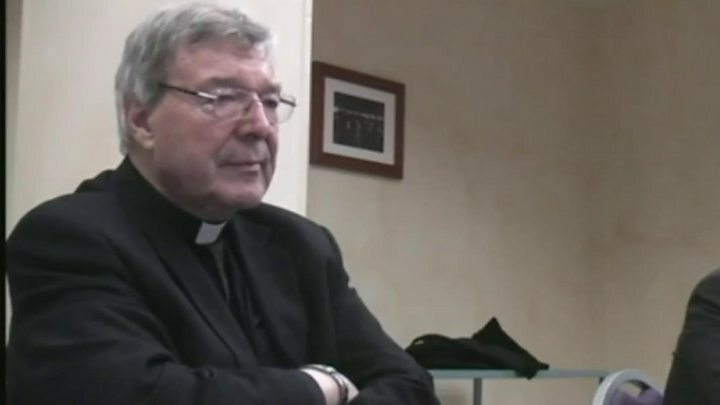 On Thursday, footage of Pell responding to the allegations for the first time - during a police interview in Rome in 2016 - was released by a court. Details of the case had been kept secret from the public until this week for legal reasons. What are Pell's grounds for appeal? Pell's lawyers argue that the verdict relied on the surviving victim's evidence, saying "it was not open to the jury to be satisfied beyond reasonable doubt". The jury had heard "unchallenged" evidence from 20 other prosecution witnesses, the defence team said. The second aspect of the appeal asserts that the trial judge had wrongly prevented an animation from being played at the trial. The final challenge concerns the alleged jury procedural error. "There was a fundamental irregularity in the trial process, because the accused was not arraigned in the presence of the jury panel as required," said lawyer Paul Galbally.